Holidays come with many traditions and food is an important part of them. 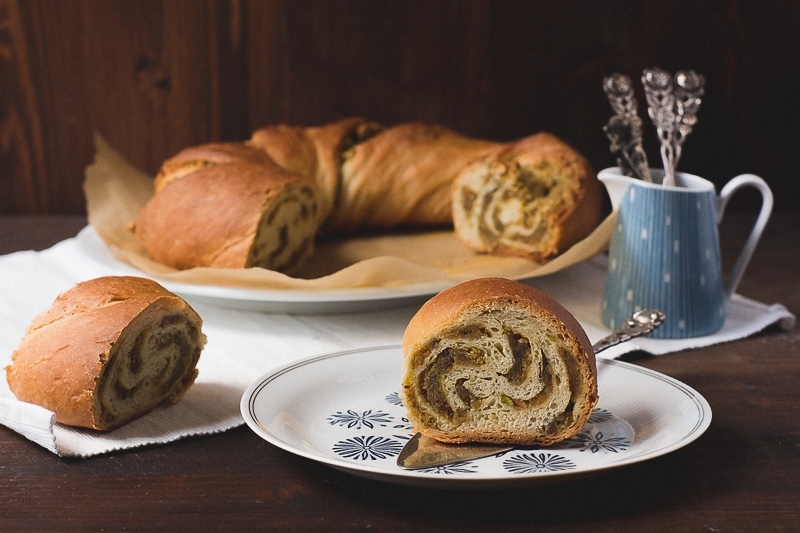 Sweetened yeast breads and braids are a very popular Easter food in Germany. Usually they are either made from an enriched yeast dough and braided or they have additional ingredients like raisins and nuts. These versions are shaped into round loaves. Of course there are many variations to this. For my Easter bread I decided to make a nut filling and shape the bread into a wreath. But not just a simple wreath. I wanted a neatly braided version similar to this one. Unfortunately I failed and my wreath did not come out as beautifully as the version I linked to. I think I made one important mistake and I am sure my wreath would turn out better next time, but I guess that has to wait until the next Easter holidays. Or maybe you can do it better? For my filling I used almonds and pistachios. The almonds are nice, but honestly I mostly used them to add bulk to the filling. 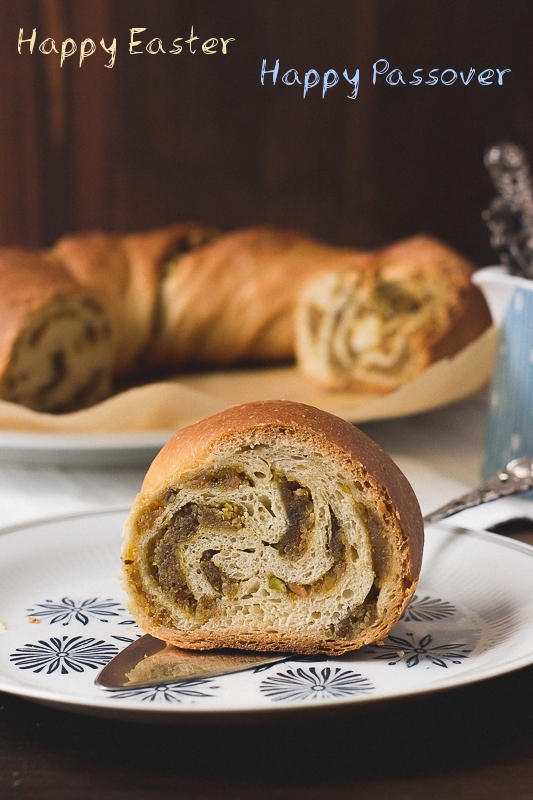 Because the real stars of this recipe are the pistachios. I love their sweet, prominent taste. Since shelled, unsalted pistachios are very expensive, I used salted ones in their shell. I removed the shell and then soaked the nuts in water over night. Then I rinsed and drained them and ground them together with the almonds in a food processor. Since the pistachios were soaked, they were a bit softer and even though I didn’t grind the nuts very thorough, I ended up with a filling that had a marzipan-like consistency. Many enriched, sweetened yeast doughs are made with eggs. Those are supposed to make the crumb light and fluffy. If you make a vegan version, there is a very simple trick to achieve a very similar texture: add more water to the dough as you usually would and resist the temptation to add more flour. Since gluten is a water soluble protein, it will form as soon as water is added to the dough. This means kneading is not as important as many people think and the water will not only do all the work, more water will also improve the texture. So you can simply stir this dough with a wooden spoon until it is well mixed and then leave it alone. After a resting time of 45 to 60 minutes it should be perfectly smooth and easy to work with. *For me 400g pistachios in their shells yielded 150 g.
To make the dough: Combine soy milk, sugar, and coconut oil in a small pot. Warm the soy milk until the coconut oil has melted. Make sure not to boil the mixture. Then cool until luke warm. Add flour, yeast, and salt to a bowl and stir until mixed. Add liquid ingredients. Use a spoon and stir until all ingredients are well incorporated. At this point your dough should be rather sticky. (Picture 1) Cover with a damp kitchen towel and let rise for about 45-60 minutes. While the dough is resting, prepare the filling: Rinse and drain your pistachios if you haven’t already and place pistachios and almonds in a food processor. Process into a sticky mass. Make sure not to overheat your food processor. Add to a bowl and mix with sugar. Set aside. Preheat oven to 160°C (320°F) and line a baking sheet with parchment paper. Transfer the dough to a lightly floured working surface and knead well or one or two minutes. 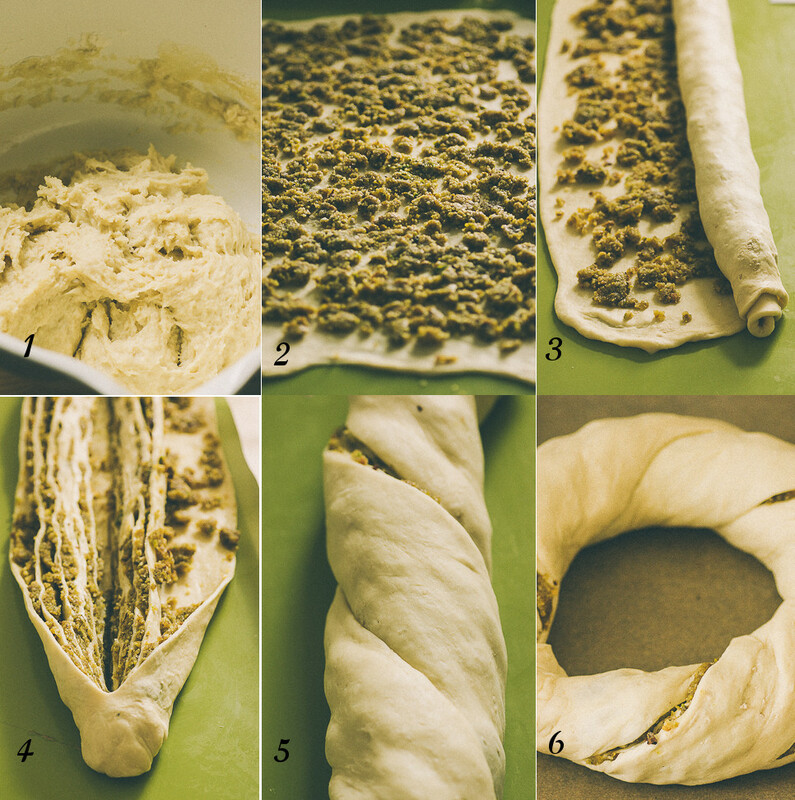 Roll the dough into a rectangle (60 x 30 cm or 23.6 x 11.8 inches). This will take a while and it usually helps to make a couple of small pauses, let the dough rest and help the gluten to relax. Then continue rolling it out. Anyway, after you cut the log, twist it (picture 5) and shape it into a wreath, making sure to pinch the ends. (Picture 6) Place on a baking sheet and cover with a damp kitchen towel. Let rest for 45 minutes. Transfer to oven and bake for 60 minutes. Check on the wreath from time to time. I had to cover it with aluminium foil after 30 minutes as the crust started to get a bit too dark. Remove from oven and let cool completely and serve immediately. Happy holidays for all of you! Beautiful! I am imagining the toothy texture. Yum.